Moldova finally changes its mind and is prepared to file a draft UN resolution calling for foreign troops withdrawal from its territory. Still, in accordance with the governing Democratic Party power-sharing with the pro-Russian President, it avoids to openly name the troops Russian and eschews to call for the change of the Russian led non-compliant “peacekeeping” to a UN or international one. The traditional goal of consecutive Moldovan Governments was to ensure the withdrawal of Russian troops that support separatism and, by the virtue of their withdrawal, to replace Moscow controlled so-called peacekeeping with an international force that is no longer supporting separatists and remains neutral. The Moldovan side failed to address the matter to the Security Council first, to at least bring the matter to the international attention, then prepared an early rushed draft for the UN General Assembly resolution in which it also fails to ask for the replacement of the Russian controlled peacekeeping. This might evoke what Transparency International called, as mentioned above, a power-sharing between the Moldovan ruling Democratic Party and the pro-Russian President Dodon, of the Socialist Party, ahead of 2018 general elections in the Republic of Moldova, where the pro-Russian forces are expected to deploy serous forces and efforts to counter pro-Western anti-corruption parties that denounce the power-sharing. The Transnistrian separatist conflict in the Eastern regions of the Republic of Moldova, a little know conflict in Eastern Europe, goes on without much progress and attention since March 2, 1992, the very same day Moldova was admitted in the UN. It has become known as a "frozen conflict" in the meantime. Previously often referred to as not an inter-ethnic conflict in the Organization for Security and Cooperation in Europe Ministerial discussions, it may be probably characterized as a conflict of USSR dissolution. Yet ethnic Russians have the control of the region and Kremlin was recognized by the European Court of Human Rights ruling being in charge of it. Since Russia "unfroze" other conflicts in the region, the situation around the Transnistrian one has seen very uneven developments. On one hand the conflict resolution talks focused on technical details, such as allowing the separatist to hold “neutral”, non-country specific, car plates for their export purposes, including by the companies with Russian investment in the time of current sanctions, while the mater of Russian troops withdrawal has seen little success last ten years. Despite such technical “successes” especially for the Russian supported exporters, by large the protracted conflict in the Eastern regions of the Republic of Moldova remains unresolved for over 26 years, and Russian troops behind the separatist movement there refuse to leave, against Moldovan laws, Russia’s own previous international commitments to withdraw and international legal rulings. Moldovan authorities persistently called for Russian troops withdrawal in Europe for years, yet little progress was achieved. In one of several discussions with Moldovan officials on these matters, I have suggested that having a larger toolbox, not only in Europe, but also globally, on Russian troops withdrawal and its Transnistrian separatist conflict in Moldova, could have some benefits from the political pressure point of view. Moldovan authorities did not dare to bring the matter to courts, though toyed with the idea. Hence at least a campaign of public awareness and political pressure may provide some steps forward, especially now that Ukraine covers the Republic of Moldova from direct contact with Russia, acting as a physical and party a security barrier between these two countries. Concerted efforts at UN and other international organizations, bilateral meetings, would have been more impactful, I argued. The Democratic Party of Moldova (DP), who signed a political cooperation agreement with Mr. Putin’s “United Russia” party in 2010,[i] spoke about the strategic partnership with Russia during their participation in consecutive 2009-2017 Moldovan governments, and that is probably why such initiatives at UN couldn’t go through. After those six years, as the government entered in the power-sharing with the pro-Russian Socialists, an arrangement some political analysts called a “binom” – a partnership of two forces, which in Moldova’s case distributed their roles along a power sharing “good cop – bad cop” formula, playing a Pro-Western Government “fighting” an anti-Western President, while coordinating behind the scenes[ii], in a way presumably “outsmarting” their potential sponsors. The lack of progress on Russian troops withdrawal matter came into political focus with upcoming elections in 2018. An online portal picked up my June 2017 farewell post in social media, where I warned that the new pro-Russian President of the Republic of Moldova prepares a UN draft on Moldova's "neutrality clause"[iii] in accordance with the wishes of the Kremlin, often and openly expressed in the media. [iv] This was a private information that I could not properly verify, though it was not denied either. Such a unilateral renunciation of “neutrality” as a bargaining chip for Moldova’s European integration seems unwise. On this note, probably feeling under some pressure of the upcoming elections and in order to attract the pro-Western voters, the Moldovan Government quickly filed a request in August of 2017 for a new UN Agenda item on the withdrawal of foreign troops from the territory of the country – a move that was easily blockable by Russia. It could be presumed that such a non-harmful initiative was intended to ease the governing Democratic Party “pro-Western” image, and, yet, still play their publicly denied part in a de facto power sharing with the pro-Russian President Dodon, as the international watchdog Transparency International called it[v]. The initiative to include Russian troops withdrawal as a topic on the UN agenda was bound to provide political points to the purportedly pro-Western Moldovan Government (as a Deputy CIA director openly called it during a recent hearing on the Hill on Russia) and avoid putting too much pressure on Russia, as Moscow had sufficient blocking power for such a UN agenda item. All the Moldovan sides in power looked either pro-Western or pro-Russian, just as they wished to appear, while Kremlin remained unharmed, with troops still in Moldova, distracting neighboring Ukraine's attention and military resources to another direction. I gave a critical interview to Radio Free Europe office in Moldova[xi], conveying that as I have previously suggested, now some former US diplomats, currently with Atlantic Council (at the end of the December 2017 Moldova meeting)[xii], as well as a number of EU diplomats, who had a closed meeting with the Moldovan Deputy Prime-Minister in NYC, yet in December of 2017, also suggested that the Moldovan authorities should have filed a resolution at UN and not a request to include the troops withdrawal as a topic in the agenda item. Several days after, the current competent Moldovan Ambassador and Permanent Representative to the UN was urgently recalled for consultations to Moldova. After consulting him the Speaker of the Moldovan Parliament changed his initial announcement of 2017 and spoke about a resolution at UN and that it will be supported by its partners – US and Germany. [xiii] The Government, hence, seemed to have quietly dropped the idea of a new agenda item and prepared to file a resolution. It is unclear if without previous public pressure such a change would have happened. The shift from a rather difficult inclusion of the Russian troops withdrawal on the UN agenda, to an easy and unblockable filing of a resolution under GUAM (Georgia-Ukraine-Azerbaijan-Moldova) existing topic of protracted conflicts, however, finally happened. This is one of the important steps for the conflict resolution and Russian troops withdrawal from the Republic of Moldova. It is important to avoid a number of pitfalls with this document that will prove central for the future of the country and its security. This resolution could be an important wheel in a larger strategic machinery to make sure Russian troops are out and the conflict in the East of Moldova is settled according to international law and rules – the country then could choose its development path in or outside the European Union and, if hopefully choosing the EU, live by the rule of law, freedoms and democratic rules. 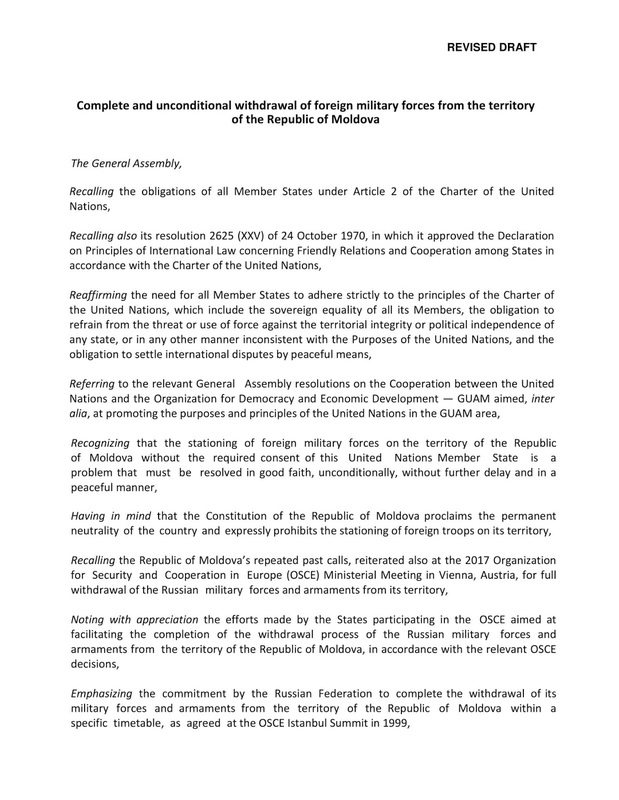 The quality of this resolution should not be underestimated from that perspective, it could become a keystone piece for a strategic effort to withdraw Russian troops and provide the country it’s freedom – hence a number of changes should be done upon the insistent of Moldova’s partners, regardless of the Moldovan side smaller electoral reasonings in this document. Elections come and go; the country’s future is what needs to be considered. Friends of Moldova’s help will prove therefore crucial for this resolution. Before resolution, where was the letter to the Security Council? Another bell that rand during this process was the fact that the Moldovan Government did not first address this issue to the Security Council, even after many joint military exercises between the separatists and Russian military. Despite being rejected, it would have created the much-needed awareness of the matter and would have legitimized bringing it to the UNGA, as the last resort. The Moldovan Government, upon our suggestions, even co-sponsored an address to a similar resolution for Ukraine, yet it failed to do so for itself and did not create the necessary visibility, public awareness and grounds for the UN General Assembly resolution. Instead this strategic issue for the Republic of Moldova’s independence is brought up only now, close to the Moldovan elections. Now that the resolution was distributed, will there be informal consultations? The logic of informal consultations on conflicts around the world, was motivated by the outcome. If there was a clear sign that no Security Council Resolution will be possible, a first round of closed discussions, between the friends of the matter, on these matters were conducted. I participated in these discussions on Ukraine and on Syria. In absence of ways to overcome the opposition of Russia in the Security Council the resolutions moved to the UN General Assembly. They did not provide a compulsory solution mandated by the UN Security Council – those were public attempts to place pressure on the parties involved in the massacre of civilians or invasion and land-grab of other countries. Other similar resolutions were tabled under GUAM protracted conflicts umbrella Resolution (as in Georgia-Ukraine-Azerbaijan-Moldova joint organization, called GUAM). UN resolutions would normally be presented for informal consultations (UN language for corrections or even negotiations of the text). The outcome was predictable, taking into account that little, if nothing, could reconcile Russian opposition to most of those conflicts. However, the absence of such informal consultations allows an easy way for mostly Russia to blame the drafters of such resolutions of lack of transparency. That would not have a legal meaning, yet it would imply that the resolution is unfairly written and thus would provide additional arguments to Russia in its calls to oppose it. The Moldovan resolution, to our knowledge is not even registered, not to mention informal consultations, though this is still a preliminary information. 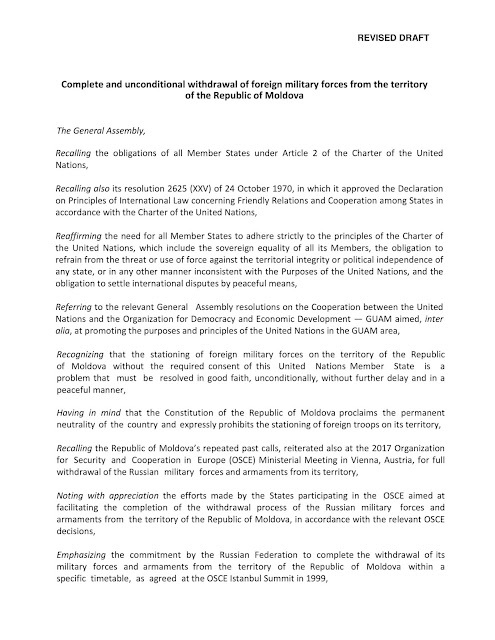 The draft does not mention explicitly that the withdrawal is requested for Russian military forces, and, in fact, also weapons, equipment and munition, as overall agreed in 1999 at Istanbul Summit (via a cross-reference between OSCE Minsters Decision and CFE Treaty Adaptation Agreement signed there in 1999 – basically “no withdrawal from Moldova till 2003 - no adaptation of the CFE Treaty that Russia is interested in.” Russia later refused to honor its commitment). This is important, in order to avoid proliferation of Russian stockpiles and weaponry to the separatist entity, black markets, as well as for a proper request of a Peacekeeping Mission for Moldova, which is sorely lacking in this document, and was in fact the main point of interest for consecutive Governments of the Republic of Moldova. The idea to change the word “Russian” into foreign is not knew. This was used during previous other OSCE Ministerial Meetings. This, however, was years ago, when Russian military did not prepare separatists for war, as they do now through joint military exercises. This idea for such an evasion now was to probably make it again “softer” and more acceptable by UN membership. As we have seen this logic was already countered by a vocal rebuff by Russia against this draft. [xiv] There is little point in avoiding the name of the country that stations illegally troops on the territory of the Republic of Moldova, since Russia will not consider the omission of its name “soft enough” and will make sure others hear that. In fact, it may be counterproductive – softness will fail to undermine the issue, and also fail to capitalize on the already existing understanding of Russia as a country disregarding territorial integrity and rights of the people of several countries, against UN Charter and international law. The fear that Moldovan power-sharing could influence this Resolution text may be valid, and though competent people worked on it, some political interference may have happened – ahead of the elections a limited resolution could cause some public image boost for the Democrats, though without harming Russia too much, for the sake of that very power sharing and upcoming elections, thus providing those in power electoral points. A Government is free to act at UN – however, and nay image point on an important security matter can be valid. The national interests should prevail however. In this respect, the first element that we noted several days after the Moldovan Ambassador recall for consultations, is that on April 19, while speaking on an already Daft Resolution on the Russian troops withdrawal, the Speaker of the Moldovan Parliament specifically and explicitly excluded the Russian controlled so-called “peacekeeping contingent” from the withdrawal process[xv]. That ran against the previous multiple Governments logic that full and complete withdrawal of Russian forces would portend a change of the existing Kremlin controlled “peacekeeping” in Moldova, where Russian troops not only fail to stop the violations in the Security Zone,[xvi] they actually co-participate in such violations or perpetrate them entirely, latest case being yesterday, June 15[xvii]. Such a voluntary and explicit exclusion of a powerful negotiations tool as the change of the Russian peacekeeping that is based on the very Operational Group of Russian Forces military, and not omission, is too worrisome. As a member of the Joint Control Commission for the implementation of the 1992 Agreement for the peaceful resolution of the Transnistrian conflict, I also participated in the negotiations with Russia ahead of Istanbul 1999 Summit, where the issue of Russian troops withdrawal was agreed through a cross-reference between a legally binding Treaty and a Political Commitment by Russia. During these negotiations preceding Istanbul Agreement, a Russian diplomat suggested that the Russian troops could not be withdrawn, because one third of the Operational Group of Russian Forces was guarding one of the largest depots of ammunition in Europe (withdrawn to Moldova from Eastern Germany – Berlin Wal fall results), another third was doing peacekeeping and the last contingent was on base, taking rest. The Russian diplomats claimed that since their overall OGRF numbers are around 1500 at that time, the discussion on withdrawal makes no sense. Later similar events of 2014 in eastern Ukraine showed that a 1000 special operations troops could make a difference. After 1999 the Russian side discussed the matter of peacekeepers separation from the rest of the OGRF with their German counterparts. In 2003 the German ministry of Foreign Affairs mediated this discussion between Moldovan and Russian diplomats, emphasizing Russian arguments that 1992 Agreement excludes peacekeepers from the withdrawal – this was the time when Germany was led by Chancellor Schroeder, later employed by Russia’s Gazprom (State run gas company that gave Russia Mr Dmitri Medvedev, the previous President and current Prime-Minister). I. The problem with the Russian argument of separating the so-called “peacekeepers” from their forces is that 1992 Agreement does not authorize an actual peacekeeping. It does stipulate that military contingents from sides implementing the Agreement (signed by Russia and Republic of Moldova) will be under the authority of the (Joint) Control Commission (UN Document S/24369, page 5, Art3. )[xviii] In practice this mean a Russian commanded operation, with the participation of the sides in conflict – Transnistrian separatists (formerly USSR/Russian army) and a third would be the newly forming Moldovan army. They would therefore implement peacekeeping actions, while legally being not peacekeepers, but military contingents in support of the Commissions – this legal provision is important from the perspective of the later actions performed by the Russian military. II. Also, as can be seen above, the “peacekeeping” was conducted by the very military of the conflicting sides, who killed each other during a recent war, which hardly corresponds to international norms and cannot lead to an actual political resolution of the conflict, but rather its perpetuation in one form or another. This is exactly where the Republic of Moldova is now – a Russian commanded “peacekeeping” force that maintains the conflict frozen. Unfortunately, as the Speaker of the Moldovan Parliament clearly stated on April 19, such a request will not be made. The draft of the new Moldovan UN resolution avoids that specific request – to at least ‘start the discussions on the change of the peacekeeping force in the Eastern regions of the Republic of Moldova’. A truly complete withdrawal of the Russian troops would allow for such a consequent request in the resolution and is intrinsically related to the withdrawal process – according to the European Court of Human Rights ruling that that Russian troops support the separatism, their departure would allow for a proper political conflict resolution and, logically, upon such a departure a new peacekeeping or peacebuilding force, perhaps consisting of policemen and development officers, would help the political resolution process. This needs to be in the Moldovan draft resolution and for now is also notably absent. To underline this important point – any UN resolution that drops the request for a new peacekeeping operation when asking for Russian troops withdrawal, and avoids the best legal ground to explain it, is a unilateral concession from the Moldovan Government towards Russia. Thus, Kremlin can again claim that all three components of their military fall under 1992 Agreement, as they perform rotating peacekeeping and cannot therefore be withdrawn. And in the interest of the Republic of Moldova’s national security his cannot happen. Another factor was taken into account – the chance that the Moldovan side was concerned about the combined Russian and separatist public response that threatened with a Palestine-like scenario of recognition for the Transnistrian region at UN (they even addressed a letter to UN on it)[xix], probably hoping to antagonize the Arab world and involve the US and Israel in countering Moldovan activism on Russian troops withdrawal. It seems that such a fear has little chances to become a reality in current circumstances. IV. The Transnistrian conflict was never an actual interethnic conflict, as at the time of the conflict 45% of the population was Moldovan, 26% Ukrainian and only 23% Russian, despite Russians running now the region. V. And currently any calls for independence as a result of Russian assertiveness, especially on such a difficult to argue matter as a non-inter-ethnic conflict, are unlikely to pass at the UN. Taking into account the knowledge of these fact, there is a great chance that the Moldovan government was informed about it, and yet limited the document for other than security reasons. When Speaker of the Moldovan Parliament stated on April 19 that the Government will ultimately file a resolution, he referred to the partner countries support for this document. To ensure that the document exceeds Moldovan election interests and becomes a national security tool rightfully protected by the UN charter and international law, some editions need to be considered on the text. PP1 – a minor issue: PP1 it rightly focuses on the obligations of the UN member states under the Article 2 of the UN Charter. However, a reference to the UN charter first and then its article 2 would have been more logical, as the Charter and its provisions are more important that any one of those separately and none of those provisions puts Moldova under stress, not even Art.1. - after “Russian Forces” a clear reference to their “weaponry, equipment and munitions” is necessary so that the local separatists don’t claim them as reparations as they attempted until now and are not later found on black markets and hot spots. Once the separatists apparently sold the weaponry form the Transnistrian region to Chechnya, who then used them against Russian military… And Chechens had a real right to ask for independence on the basis of their ethnicity and statehood. However, nobody wants these weapons from the Transnistrian region in Syria or elsewhere these days, in the same manner. b. To introduce an OP calling for international peacekeeping to counterbalance the Russian narrative and show its commitment to a peaceful resolution of the conflict, within the internationally recognized border, in accordance with the Moldovan-Russian basic treaty, which also recognized Moldova’s territorial integrity and sovereignty, and in accordance with the Moldovan 2005 law that can provide Transnistrian region a very wide autonomy! Instead of P.S. - I was also about to forget to mention mention Ukraine's initiative to open a corridor for the Russian troops withdrawal from the Republic of Moldova - it was also omitted in the resolution. This initiative of Ukraine is no small element in this matter. To finally conclude, I will reiterate a previous point - This resolution could be an important wheel in a larger strategic machinery to make sure Russian troops are out and the conflict in the East of Moldova is settled according to international law and rules – the country then could choose its development path in or outside the European Union and, if hopefully choosing the EU, live by the rule of law, freedoms and democratic rules. The quality of this resolution should not be underestimated from that perspective, it could become a keystone piece for a strategic effort to withdraw Russian troops and provide the country it’s freedom – hence a number of changes should be done upon the insistent of Moldova’s partners, regardless of the Moldovan side smaller electoral reasoning in this document. Elections come and go; the country’s future is what needs to be considered. Friends of Moldova’s help will prove therefore crucial for this resolution.